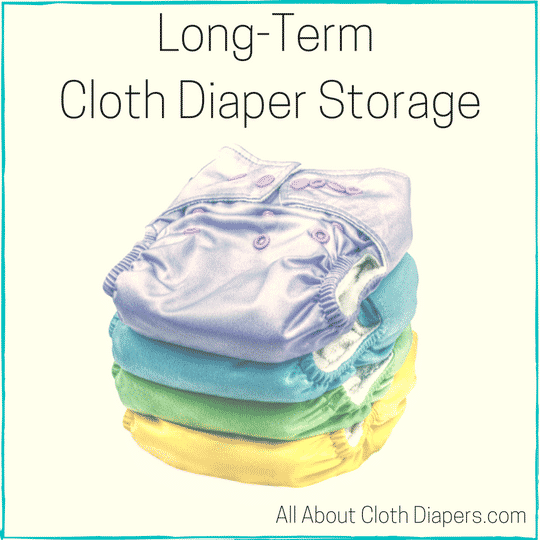 Is there a right way to store cloth diapers long-term? I’ve asked a few professionals, and the consensus is that there are a few easy steps you can take to ensure that when you bring the diapers out again…they still work. Make sure clean diapers are thoroughly dry. Running them through an extra drying cycle isn’t a bad idea as any moisture will turn to mold in storage. Once dry, place in a breathable container. Pillow cases, canvas bags or cardboard boxes are all fine. Stay away from plastic totes or vacuum seal bags for long-term storage. Place in a cool, dry location. This could be in a bedroom closet or under a bed (this tends to be a dustier location, just something to keep in mind). Stay away from attics (extreme heat) or basements (moisture). 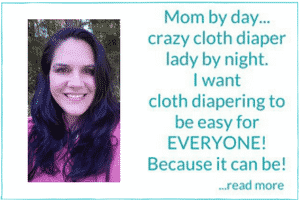 When you are ready to use cloth diapers again, go ahead and wash them as usual and use. A few things to know: They are recommending a breathable container because all fabrics do better when they are exposed to air. Removing the air could cause yellow staining and also destroy elastics…which are sort of important for diapers. Extreme heat can also have the same effect. To corroborate my instructions, I also asked a few leading industry experts. They’ve also added a few extra tips to ensure that your diapers come out as pretty as they went in. Before storing diapers make sure they are clean and dry. If the diapers are not dry, they may form mildew which will most likely ruin your diapers. To preserve the components in your diapers, store them in a container that will keep them dry in a temperature controlled environment. If you live in a humid area, layering tissue paper in the box is also a great way to prevent mildew. Storing diapers properly is so important. I’ve seen diapers stored for a year and be shot and diapers be used non stop for years that are still going strong. There are many variables but here are my suggestions for storing diapers long-term. Make sure the diapers are well washed and rinsed to ensure that no residues are left in the fibers, these residues will breakdown the fabrics and elastics. Make sure the diapers are well dried, putting damp diapers away could lead to mold, mildew and rotten elastics. I would also keep them in a closet or in an under the bed storage bin over storing them in a basement because of the potential for excess humidity. It goes without saying you should wash them before storing but I recommend a deep washing. After years of use, your diapers will have buildup that can attract bacteria and bugs while in storage. To prevent this I recommend washing them using your normal wash routine and follow that with a few hot washes with no detergent. Be sure to check the agitation cycle for detergent suds. If you see any, keep rinsing with hot water only until they’re gone. Dry and then store. I recommend starting off by running your ‘clean’ diapers through a complete hot wash cycle with no detergent to remove any lingering detergent residue. Sun out any stains before storing to prevent them from setting. Next and most importantly, your diapers must be 100% dry before storing long term. Any moisture could lead to mold or bacteria growth. If you normally hang dry, you’ll still want to run them through the dryer after they are dry by your normal standards for 20- 30 minutes on low or medium to be sure all moisture is gone. Basements, attics and garages are NOT ideal for storing diapers. Store them in a temperature controlled room. Putting them inside pillow cases on a shelf in a closet is probably the best option. Informally keeping them in a dresser drawer or in a basket in the closet is fine. They should not be stored air tight or in plastic. Rubbermaid totes are ok as long as they are not over packed and there is room for air. If you use a tote, open it up and check on your diapers at least a couple times a year. Diapers need to breathe to be sure the elastics don’t disintegrate. 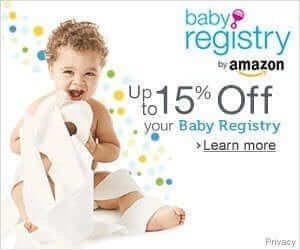 Have you ever stored your diapers successfully long-term? I’d love to hear how you did it! How long Is long term? I’m collecting my stash for baby arriving in December. So they will sit in plastic totes for like 5-6 months probably. Is that ok? I would think you would be ok with that amount of time. The key is to not deprive them of air, not to keep them in moist areas or anyplace too hot. Awesome post! I just wished I had this two years ago when I stored my daughter’s stash! I actually just pulled them out for Baby #2, and I’m wondering if you have any advice for prepping diapers that have been in storage? I read in the article that you can just start using them, but I thought it wouldn’t hurt to throw it out there to see what you’d recommend/others have done. I have stored most of mine in a cedar chest for the last 2.5 years. They still look amazing!